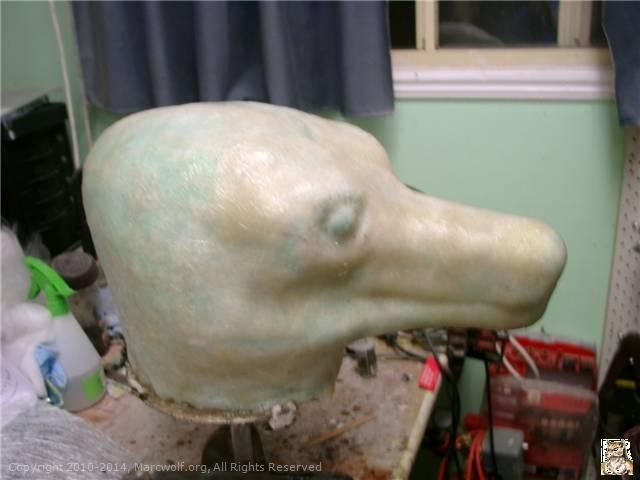 I am trying to find any company which makes the the casts and foam latex skin for a animal for me to start my animatronics. I am in the UK. I have the DVDs from Rick lazzarni and would like to get started. Any help would be much appreciated. 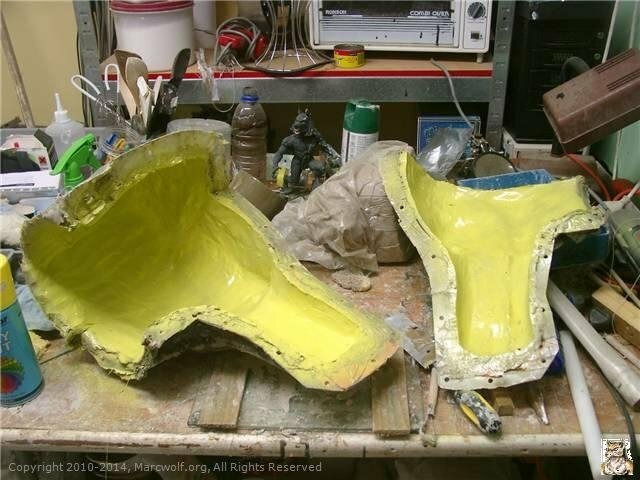 I don't know of any companies that sell foam latex skins, as that is something people normally make on their own. You can get various animal forms from a company like http://www.vandykestaxidermy.com/ and sculpt/mold your own skins though. One suggestion when you get ready to work on the skin..
Getting the right skin thickness is often key to the way the skin will move over the animatronics. Too thin and you will see the pressure points of the movement points underneath. Too thick and the servo's will not have the strength to move the skin. 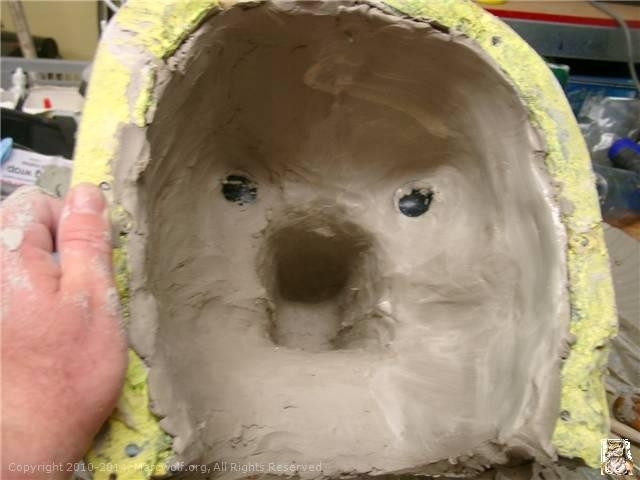 Although there is the rule of thumb where after you have made the outer (skin) mold of your sculpture you then layer clay on the inside so to get the ceneral shape of your underskull. However that is still a rule of thumb for skin thickness and if this is your first time you may have to do several runs to get the thickness just right. But if your a hobbyist like me - that can be very expensive both for foam latex and silicone. What I did (and it worked very well) was to use Gelatine to make test skins. You pour the warm liquid Gelatine as if you are making a silicone or foam latex skin, and when it has set remove the outer mold shell. 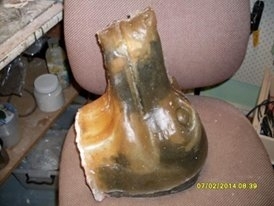 You should now see a translucent layer of Gelatine over the underskull mold. Now you can easily use a needle to pierce through the Gelatine to measure it's thickness. Remove sections to add to the underskull to make the skin thinner. Or work out where to add reinforcing to area's (lips, edge of the mouth) with additional supports. Nylon stocking material works really well. The good thing is that you can easily strip off the Gelatine and then re pour it again and again until you are happy with the skin thickness, and then do the final pour of Foam or Silicone. Gelatine can also be gleaned by hot water and will not affect Silicone or Foam Latex. 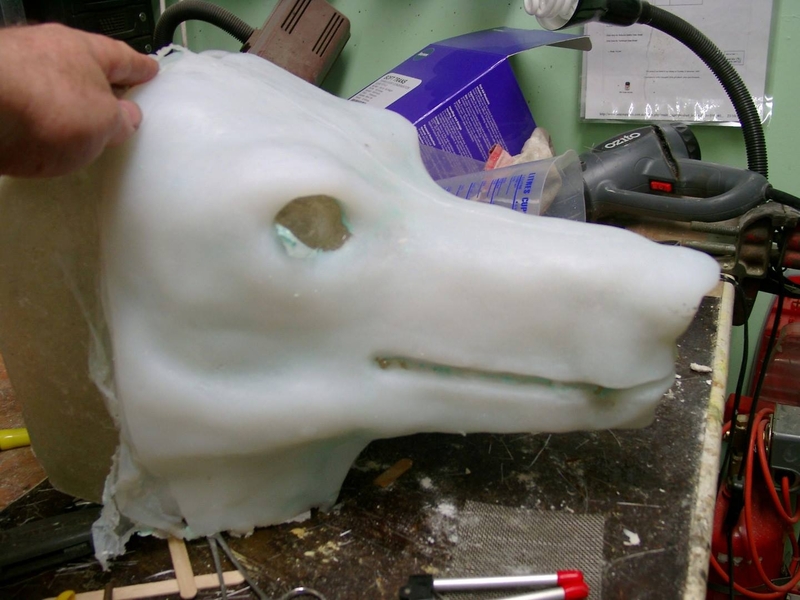 Here is my sculpture of a wolf's head being prepared for making the skin side mold. 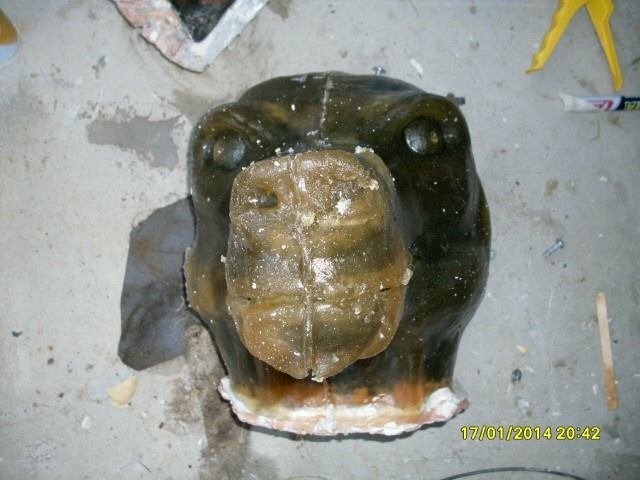 Completed Skin side (outer) mold. Layering in the clay to make the skin thickness. 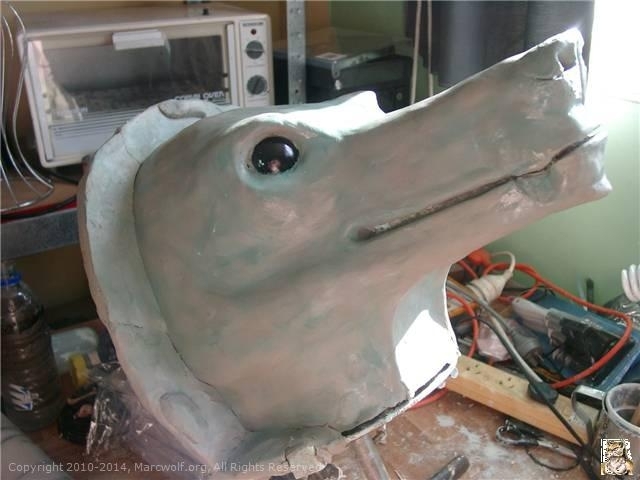 Completed Underskull - ready for animatronics. Remember - This will be a perfect representation of your finished skin. You can also use alginate for the same purpose. Although, it DOES have a few drawbacks. It is not re-usable. Depending on the brand you use, it can be quite delicate & fragile. And, it WILL dry out. Mind you, depending on your purposes, you COULD use the disadvantages to your benefit. Say, for example, you wanted to make a "shrivelled pelt" of your monster. ('Just an idea.) To minimize the shrinkage of the alginate, you can add glycerin to the water you mix with the alginate. You can use up to a one to one ratio, glycerin to water. This glycerin/water mix is then added to the alginate in the normal proportions. The more glycerin you add to the mix, the longer the alginate mould/casting will last before noticable shinkage occurs. With the 1:1 mix, I've successfully had moulds/castings last up to a solid week, before shrinking. Your individual mileage may vary. 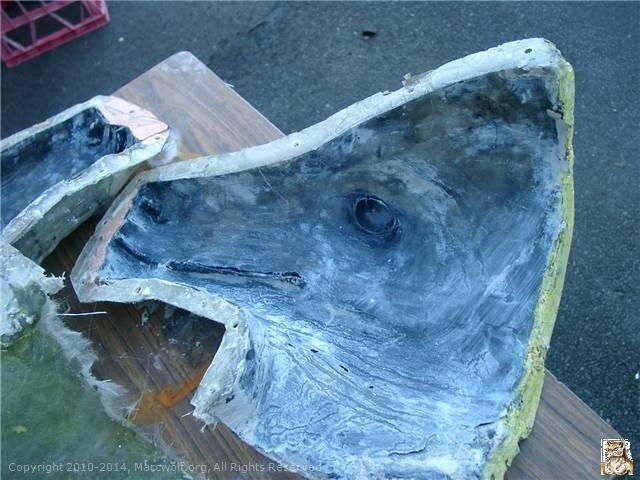 If you do use gelatin, to make test skins, make sure your mould(s) can withstand the temperature of the molten gelatin. Make sure to warm the mould(s) as much as you can physically withstand. This will help make better, bubble-free castings, and minimize any possible "thermal-shock" your mould(s) may experience. It should also help extend the life-span of your mould(s). Pouring hot gelatin into a cold mould WILL cause it to crack. Those cracks may not appear immediately. But, the more times hot gelatin is poured into cold moulds, the more likely the moulds will suffer catastrophic failure. Trust me, NOT a fun time!! !